Episode 39: "Three for One"
Stephan Cosgrove enters Ames Treasure House, an exclusive antique shop on London's Bond Street, seeking pieces of fine china on the recommendation of the shop's manager, Peter Ross. During his inspection of a particular piece bought out of a display shelf by Rodney Ames, Cosgrove removes a hammer from his coat packet and smashes it. Entering to see the cause of the noise, a stunned Ross asks his friend the reason for his destruction to which Cosgrove replies, "I don’t know, Peter, I honestly don’t know." 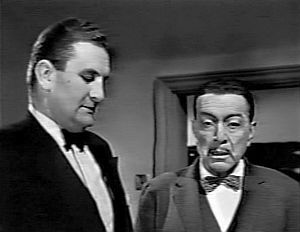 Later that day, Charlie Chan speaks with Peter Ross who tells him that of a rash of similar events which has caused his father-in-law, Mr. Ames, the Treasure House's owner, to suspect Ross of trying to sabotage his business. Also, it comes out that Ross was not too keen on his daughter Betty's marriage to Ross. Chan asks Ross the names of the others, all acquaintances of Ross, who also damaged antiques. Ross names Herbert Hodges, a taxidermist who vandalized a painting by Picasso with a knife, Doris Tillman, manageress of a high-end restaurant owned by a noted vaudevillian, who poured acid on old tapestries, and Stephan Cosgrove who belongs, along with Ross, to the Blenheim Club. Chan then leaves to interview the three individuals. Speaking with Herbert Hodges at his taxidermy shop, Chan learns that Hodges has no recollection of his actions at the antique dealer. He tells the detective that while he walks in his sleep at night on occasion, his visit to the shop was in the morning while he was wide awake, at least until he slashed the Picasso of which he has no memory. Next, visiting Doris Tillman at the Hastings Grill, which she manages, Chan hears a similar story. Miss Tillman's first recollection of her destructive act was seeing the smoldering tapestry in front of her. Rubbing her eyes, Chan asks her if she is alright as the owner of the restaurant, the outgoing Walter Hastings enters. Hastings offers Chan a dinner on the house, while his conversation focuses on his past as a vaudeville performer. Chan takes his leave and, at the Blenheim Club, he speaks with Stephan Cosgrove, whose story matches those of both Mr. Hodges and Miss Tillman. He tells Chan that he has never had a blackout in his life, and has never even been seriously ill for thirty years, not counting the injury to an eye which currently requires he wear a patch while he is under the care of his eye specialist, Dr. Hilary Sanders. Returning to give Ross the news of his lack of substantial findings in this case, the detective hints that he may have an idea as to a missing piece to this current puzzle, but must wait to see if it proves out. Continuing, Chan reveals that he believes that the acts of destruction carried out at the Treasure House did not occur to harm Rodney Ames, but, rather, were directed at Ross. When asked by Chan to recall anyone in his life who could be an enemy, Ross, after pondering, mentions Marilyn Marsh, whom he had known before meeting his wife, Betty. Ross adds that Miss Marsh would not be in a position to carry out a revenge plot as she had taken her breakup with Ross so badly that she ended up in a rest home. Ross notes that should the acts of destruction continue, he will be out of a job. Suddenly, there is commotion out in the shop, Ross and Chan rush in to find Mr. Ames struggling with an assailant who has just destroyed an antique chair. When the man is subdued, he turns out to be another friend of Ross names Colin Prentiss, who, as the others before him, cannot remember anything prior to his being stopped. Having lost his glasses during the struggle, Mr. Prentiss states that without them he cannot see. Finding his glasses are broken, he says that he needs them replaced immediately by his eye doctor, Dr. Sanders. Noting that both Stephan Cosgrove and Colin Prentiss are patients of Dr. Sanders, Chan decides to carry on his investigation through a visit to that doctor's office. At three o'clock that afternoon, Charlie Chan is able to meet with Dr. Hilary Sanders. The doctor admits to a connection with Peter Ross as the former had been romantically involved with Betty Ames before she had suddenly become involved with Ross. During the course of their conversation, the doctor "accidentally" switches on an unusual light on his desk which shines into Chan’s eyes, prompting the detective to shield his face, bringing an apology from Sanders. Continuing their conversation, the doctor confirms that Herbert Hodges, Stephen Cosgrove, and Colin Prentiss, who had visited his office that morning. When asked about Doris Tillman, Dr. Sanders states that he sees her often at the Hastings Grill which she manages which is downstairs from his office but not as a patient, as the grill is something of a "branch office" for him. Three hours later, Chan meets with Ross, who is running late. Chan shares his opinion that all of Ross' friends committed their acts of destruction while under hypnosis and that each has findings. Also, he notes that all have eye problems and all are patients of Dr. Sanders, except for Miss Tillman, although she sees the doctor regularly at the restaurant. As the clock in the room begins to chime six o'clock, Ross becomes trance-like, pulls a gun from his pocket, and tries to shoot Chan, but misses as the detective quickly moves from the line of fire. When Chan brings Ross out of his trance, the latter is completely unaware of what has just transpired. When asked by the detective where he had been before arriving for their meeting, Ross draws a blank, but when pushed, he does recall having had lunch at the Hastings Grill. Chan suggests that they visit the Hastings Grill for dinner, and that Ross invite guests from a list he will provide. That evening, Chan meets with all suspects at the Hastings Grill. While the guests order their dinner, Miss Tillman informs Chan that Mr. Hastings would like to see him in his office. As Chan enters, Hastings, sitting at his desk, has set a small, mirrored ball suspended above the desk lamp spinning. As Chan comments about the spinning, glittery ball, Hastings, noting its beauty, suddenly shifts his friendly attitude to a more focused, menacing tone as he directs Chan to focus upon the ball. It appears that the detective is falling into a state of hypnosis as Hastings continues his dialog. Apparently under his control, Chan is commanded by Hastings to follow him into a storeroom which has a trap door to the river below. As Hastings prepares the detective to take the fatal step, Chan suddenly trips up Hastings and holds him at gunpoint. Hastings tells Chan that he sought to ruin Peter Ross because the woman that Ross had promised to marry before meeting his present wife, Betty, was Hastings’ sister whom he, according to Hastings, "treated her like dirt." Soon, celebrating with his guests at the Hastings Grill the successful conclusion to this case, Charlie Chan notes that Walter Hastings was known in the theater as the Great Van Joosen, a celebrated hypnotist. New Bond Street - Bond Street, which has been a prestigious shopping area since the 18th century, is located in London's West End and connects Piccadilly to the south with Oxford Street to the north. 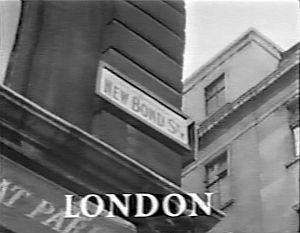 New Bond Street is the longer, northern section and Old Bond Street is the southern section. When two and two equals five, then it is logical to suspect that one has been added. Jilted lady sometime suffer more from wounded vanity than from wounded heart. Old saying: "Tides of good fortune change when least expected." Time, of humble ex-inspector of police, always available to employer. Chinese do not like cold water.